Trump's narcissism is eclipsed only by his stupidity as evidenced by a recent tweet undermining the veracity of climate change. "Brutal and Extended Cold Blast could shatter ALL RECORDS - Whatever happened to Global Warming? ", Trump tweeted. If we ascribe an actual strategy to his twitter tirade we can infer that Trump was attempting to counter the public's growing awareness of climate related extreme weather events. The hurricanes on the East Coast and wildfires in California are indeed a painful reminder of Trump's ignorance. Or Perhaps it really is because he is that stupid. Climate scientist Michael Mann has an especially dim view of the US commander-and-chief. 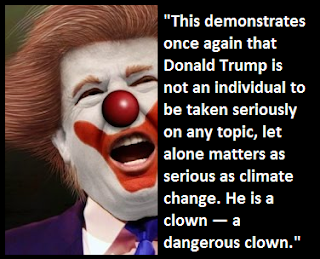 In response to the president's tweet Mann told the Huffington Post: "This demonstrates once again that Donald Trump is not an individual to be taken seriously on any topic, let alone matters as serious as climate change. 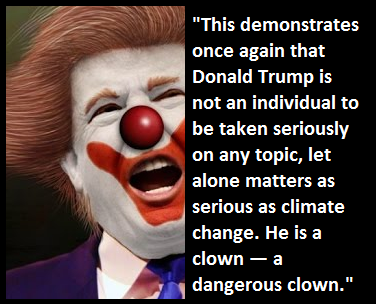 He is a clown — a dangerous clown." Trump and his minions have accrued a track record of policy positions that ignore climate science and eschew the costs of global warming. Despite the ever rising tide of urgency Trump avoids the issue of climate economics altogether. After almost two years his pessimal presidency has proven to be nothing short of a nightmare. It is not just his flagrant dishonesty or his bullying. Trump is being investigated for a whole host of criminal activities including collusion with the Russians to win the election of 2016, tax fraud and obstruction of justice. He has eroded the US credibility and been a harbinger of hate. His rhetoric is directed at anyone who opposes him from heads of state to venerable domestic institutions. He regularly attacks the judiciary, the intelligence community and the press. In 2016 Americans could look back in gratitude at the accomplishments of the Obama administration. The contrast between trump and his predecessor could not be more stark. Obama's scandal free presidency was replaced with an unprecedented level of corruption. Hope has been in short supply since Obama completed his second term. That is until the midterm elections of 2018. Americans can be thankful for the checks and balances from the newly flipped House of Representatives. This will give Congress the authority imbued by the constitution to formally challenge this president's malfeasance and Republican obsequiousness. Despite the short term benefits afforded by radical deregulation and tax cuts, corporate America cannot avoid the realization that Trump and his Republican minions are bad for business and bad for the country. From the start Trump has not been able to get along with business leaders. He was even forced to disband his business councils in the wake of the resignations of some of America's leading CEOs. More recently he has started trade wars that have hurt American companies. It is becoming increasingly apparent that Trump is on a collision course with America. Trump's vision of the country is at odds with the intent of the founding fathers and the venerable traditions that have made the country great. Last Thanksgiving corporate America offered a ray of light and this year that light appears to be getting brighter. As evidenced by corporate activism in the midterms, a growing number of business leaders are opposing this president's agenda. Some corporate leaderships may be acting to protect their vested interest, while others may feel morally obligated to defend the national interest. If nothing else many realize that this administration will be judged harshly by history alongside those who failed to act. Can corporate America avoid challenging this president's deceitful narrative? Can consumer facing brands afford to stay on the sidelines? They can either risk trying to fly under the radar or they can rise to the occasion.